TranSantiago in action. Photo by Cobalito. So what went so wrong with TranSantiago, the Chilean capital’s new bus system, that warranted a national apology from the president? 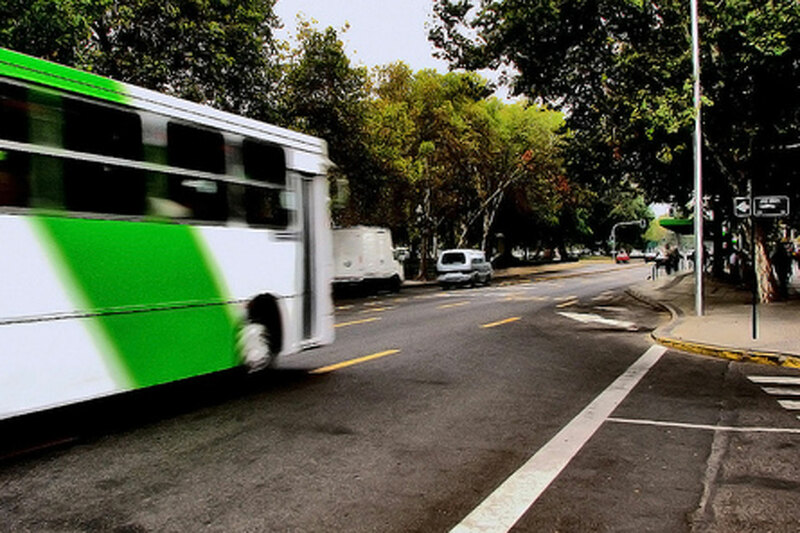 Conceived more than six years ago, TranSantiago was nothing less than a complete overhaul of Santiago’s public transit system with a particular focus on the buses that clogged the city’s streets. In broad strokes, Santiago took old, polluting buses off the streets, partially replaced them with new, clean buses, and reorganized bus routes to maximize the efficiency of the system as a whole. The whole purpose was to reduce system costs and, very specially, to reduce air pollution, a major problem due to thermal inversion in the winter months. After six years of planning, the new system was launched in early February of this year. The results have been far from impressive: service coverage declined, waiting times increased, reliability dropped, and to top things off, buses and trains were overcrowded, bursting beyond capacity, and causing all sorts of delays. The horrendous service resulted in strong public protests, and even rioting in some areas of the city. The system accomplished exactly the opposite that it was intended for, as car ownership and car use rapidly increased as a solution to meet their commuting needs (see ad by a car dealer). the failures of TranSantiago to promote their vehicles. In a story from NPR yesterday – the impetus of this post – a commuter talked about the anxiety and stress that the failures of the new system placed on Santiago’s 5.5 million residents, many of whom commute daily on public transportation: “When the trains get here, everybody rushes and people hit each other, shoving and pushing. So you get to work all stressed out. You leave all stressed out. I’m just waiting for someone to hit me. I’ll hit them back.” Even worse, according to NPR, some commuters have reported that delays from the new system made them habitually late for work, resulting in them losing their jobs! Some have come away from the TranSantiago experience thinking that large and chaotic bus systems like Santiago’s cannot be fixed without creating an even bigger mess. I want to state unequivocally that this is simply not true. TranSantiago was the most ambitious transport modernization project in a developing city that was carried out in the last decade. The concept was good, but as the adage goes, the devil is in the details. During the development stages, important design components were overlooked. For example, there were not enough bus-exclusive lanes. Low-capacity bus stops were created instead of high-capacity bus stations. And the payment system required commuters to pay once they board, not when they entered the stations. All of these combined to produce overwhelming inefficiencies, with the commuter bearing the brunt of the burden. What we should take away from TranSantiago is that a project of such a massive scale demands a comprehensive design and implementation process, with all stake holders directly involved and in constant communication. Quality of service should not be secondary to economic and environmental considerations. At least the average existing service conditions (coverage, total travel time) should be maintained. On the bright side, the Chilean government has since launched several improvement initiatives, and Santiago will have the first truly integrated system in a major metropolitan area in Latin America. Today it is certainly not an example of a good example, but in quite a short time I expect that we will look back to Santiago for inspiration.